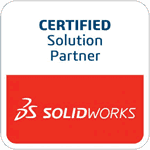 Springville, CA, August 28, 2012 – TEDCF Publishing, a SolidWorks Solution Partner and producer of interactive, multimedia training courses, today announces the availability of SolidWorks 2012: Professional Modeling. The course has over 6 1/2 hours of instruction that teaches founding modeling concepts through advanced best practices. David Melvin, PE, the author of the course, demonstrates modeling processes designed to speed workflow and improve model performance. The course is the first part in a four part series of courses for SolidWorks 2012 that will be released this year. It is currently available for download and the DVD can be pre-ordered. The DVD will ship on November 17, 2012. Visit Professional Modeling 2012 to learn more and watch sample lessons. Founded in 2000, TEDCF Publishing is a division of The Engineering Department Consulting Firm. The company attained recognition as an Autodesk Authorized Publisher & Developer within the first year of business. The company provides training courses for Autodesk Inventor 6 through 2013, SolidWorks 2009-2012, and Microsoft Excel.